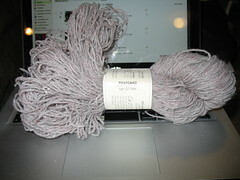 Knitting Relaxes Me: Well, hello there! If I have any followers left -- I had a very busy October and am just now recovering from it! Mostly, it was "work busy," since I was at two conferences. There was knitting at both, but the second, in Baton Rouge, was best, at least in part because I got to see Steven! 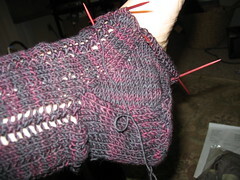 I was working on a sock while I was there -- the Lenore socks I talked about in my last, long-ago post. I worried that they might be too small, remember? 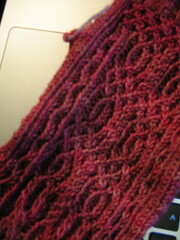 After I turned the heel on the first one, I decided to slip it on to see how it fit -- and it was huge! My third currently-active project is (are?) my Entangled Stitches gloves. 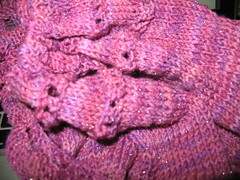 I'm working on the index finger of the right glove right now, but what you see here is just the back of the hand. There's a mis-crossed cable there, but we won't talk about that. There's another skein of Postcard (a gorgeous pale grey with flecks of pink hidden in it), which Alice had some fun with in the few minutes between when I dropped in and when I realized it was gone. I think it will be fine. 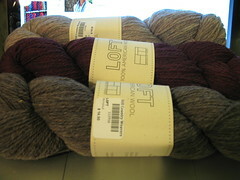 I hope so, since I plan to use one skein for Pei, and the other, with Homemade Jam, for the mittens. I'm not sure what the Stormcloud will be -- when I ordered it, I thought I might use it for the mittens (with Postcard), but I think Homemade Jam is a better choice. 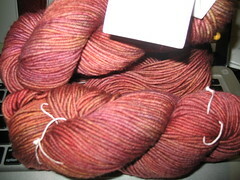 High on my queue is also Jared's Juneberry Triangle, which I plan on making from Madeline Tosh Vintage in Amber Trinket, which is an absolutely lovely color -- a mix of reds and ambers and bronzes, and a little darker than my picture. Whew!! You have been busy busy busy!! Ha ha! Trust me you'll put out a chihuahua sweater fast if you can get all of that other stuff accomplished! i'm still around! you've got some great projects on the needles, i must say! Ha! Alice really went to town on that yarn! I just ordered my first LOFT and am anxious to receive it. YUM. I'm pretty sure I could not find a miscrossed cable with a magnifying glass in that intricate glove. Beautiful! It was great seeing you in Baton Rouge! Love, love, love your color selections of Loft -- I particularly like the Homemade Ham. And the stitching on that glove is beyond intricate. I cannot wait to see the chihuahua sweater. I've been so busy I'm just catching up to reading blogs. Those I haven't consigned to blog reading bankruptcy, that is. I'm interested in what you think of Loft.